Download "Trade finance in Nigeria: Structured commodity financing as an instrument for mitigating risk"
1 Trade finance in Nigeria: Structured commodity financing as an instrument for mitigating risk By Olutola Bella, Banwo & Ighodalo The buoyancy of international trade and access to trade finance are key contributors to the development of any nation s economy In 2009, the volume of Nigeria s international trade amounted to circa US$80.74 Billion constituting about 22.6% of its total Gross Domestic Product (GDP) 1. Since more than ninety percent (90%) of trade transactions involve some form of credit, insurance or guarantee, trade finance is undoubtedly, the very fulcrum for international trade. By bridging the information asymmetry between buyers and sellers, and creating a trust-based system whereby upon fulfilment of certain conditions, sellers receive payment for goods sold and buyers get the goods they paid for, trade finance guarantees increased international trade. 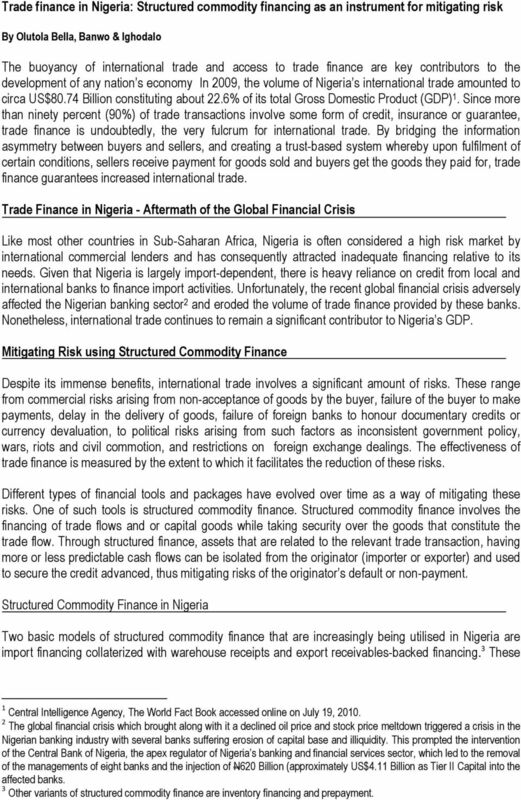 Trade Finance in Nigeria - Aftermath of the Global Financial Crisis Like most other countries in Sub-Saharan Africa, Nigeria is often considered a high risk market by international commercial lenders and has consequently attracted inadequate financing relative to its needs. Given that Nigeria is largely import-dependent, there is heavy reliance on credit from local and international banks to finance import activities. Unfortunately, the recent global financial crisis adversely affected the Nigerian banking sector 2 and eroded the volume of trade finance provided by these banks. Nonetheless, international trade continues to remain a significant contributor to Nigeria s GDP. Mitigating Risk using Structured Commodity Finance Despite its immense benefits, international trade involves a significant amount of risks. These range from commercial risks arising from non-acceptance of goods by the buyer, failure of the buyer to make payments, delay in the delivery of goods, failure of foreign banks to honour documentary credits or currency devaluation, to political risks arising from such factors as inconsistent government policy, wars, riots and civil commotion, and restrictions on foreign exchange dealings. The effectiveness of trade finance is measured by the extent to which it facilitates the reduction of these risks. Different types of financial tools and packages have evolved over time as a way of mitigating these risks. One of such tools is structured commodity finance. Structured commodity finance involves the financing of trade flows and or capital goods while taking security over the goods that constitute the trade flow. Through structured finance, assets that are related to the relevant trade transaction, having more or less predictable cash flows can be isolated from the originator (importer or exporter) and used to secure the credit advanced, thus mitigating risks of the originator s default or non-payment. Structured Commodity Finance in Nigeria Two basic models of structured commodity finance that are increasingly being utilised in Nigeria are import financing collaterized with warehouse receipts and export receivables-backed financing. 3 These 1 Central Intelligence Agency, The World Fact Book accessed online on July 19, The global financial crisis which brought along with it a declined oil price and stock price meltdown triggered a crisis in the Nigerian banking industry with several banks suffering erosion of capital base and illiquidity. 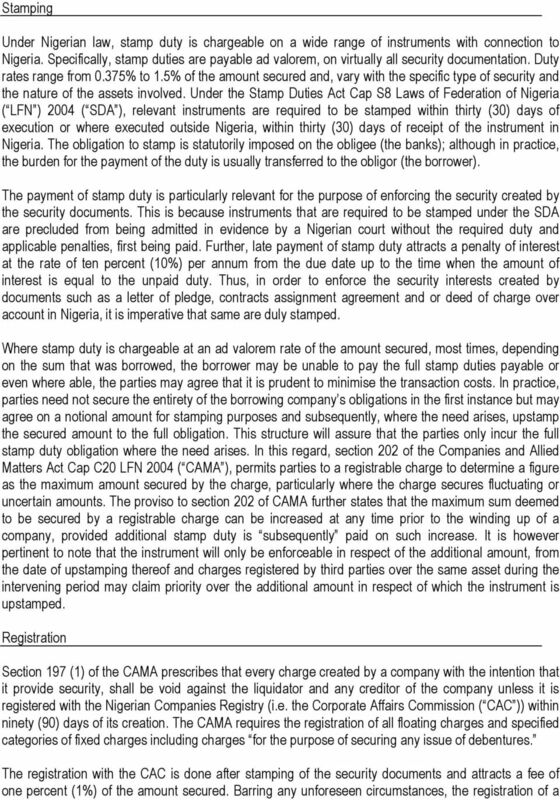 This prompted the intervention of the Central Bank of Nigeria, the apex regulator of Nigeria s banking and financial services sector, which led to the removal of the managements of eight banks and the injection of N620 Billion (approximately US$4.11 Billion as Tier II Capital into the affected banks. 3 Other variants of structured commodity finance are inventory financing and prepayment. 2 models simply involve the use of security structures that complement security interests like pledges and charges. With respect to import finance collaterized with warehouse receipts, it is common for banks to secure the financing of international trade by taking pledges over the goods purchased by the importer with the credit advanced. However, given the impracticability of the bank to actually take physical possession of the goods, the bank would usually take a pledge over the bills of lading 4 and appoint an independent collateral manager, who is knowledgeable about the nature of the goods, to monitor the goods. For this purpose, the bank, the collateral manager and the importer would enter into a tripartite collateral management agreement. Under this agreement, the collateral manager assumes, on behalf of the bank, custody of the goods until they are sold to final offtakers and the proceeds of sale, used to offset the importer s outstanding loan with the bank. Importantly, upon importation of the goods, same are transferred to a warehouse under the control of the collateral manager. The collateral manager then issues warehouse receipts, 5 made out in the name of the bank, which state the quality of the goods, the quantity received, and the value at time of receipt. These warehouse receipts will serve as a security for the loan advanced to the importer. The collateral manager is also obliged to issue periodic reports which ensure that the bank can monitor the total value of the goods in stock and the accounts receivables, thereby effectively keeping an eye on its credit risks. Stock will be released from the warehouse only upon the instructions of the bank. 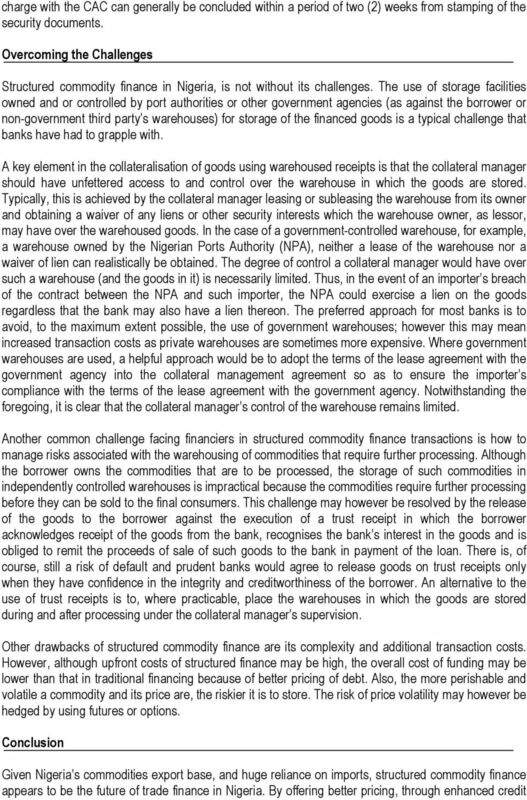 Likewise, movement of stock from one storage facility to another will require prior authorisation of the bank and will be subject to the supervision of the collateral manager. 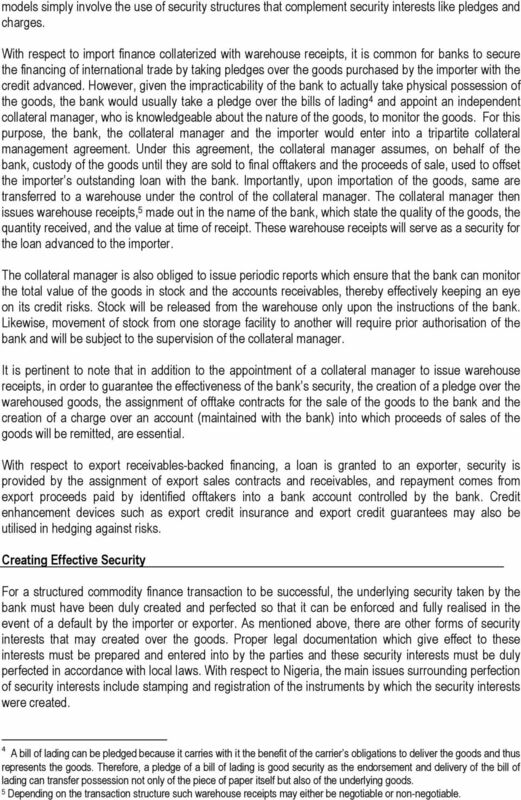 It is pertinent to note that in addition to the appointment of a collateral manager to issue warehouse receipts, in order to guarantee the effectiveness of the bank s security, the creation of a pledge over the warehoused goods, the assignment of offtake contracts for the sale of the goods to the bank and the creation of a charge over an account (maintained with the bank) into which proceeds of sales of the goods will be remitted, are essential. With respect to export receivables-backed financing, a loan is granted to an exporter, security is provided by the assignment of export sales contracts and receivables, and repayment comes from export proceeds paid by identified offtakers into a bank account controlled by the bank. Credit enhancement devices such as export credit insurance and export credit guarantees may also be utilised in hedging against risks. Creating Effective Security For a structured commodity finance transaction to be successful, the underlying security taken by the bank must have been duly created and perfected so that it can be enforced and fully realised in the event of a default by the importer or exporter. As mentioned above, there are other forms of security interests that may created over the goods. Proper legal documentation which give effect to these interests must be prepared and entered into by the parties and these security interests must be duly perfected in accordance with local laws. With respect to Nigeria, the main issues surrounding perfection of security interests include stamping and registration of the instruments by which the security interests were created. 4 A bill of lading can be pledged because it carries with it the benefit of the carrier s obligations to deliver the goods and thus represents the goods. Therefore, a pledge of a bill of lading is good security as the endorsement and delivery of the bill of lading can transfer possession not only of the piece of paper itself but also of the underlying goods. 5 Depending on the transaction structure such warehouse receipts may either be negotiable or non-negotiable. 5 and mitigation of risk, overall lower transaction costs as well as longer maturity periods, structured finance enables financing on better terms. With structured commodity finance increasingly gaining popularity, Nigerian importers and exporters can have access to a whole range of alternative financing solutions, with a single, overriding objective - obtaining credit in markets where conventional financing methods have not been optimal. 18 Sources of Short-term Finance 18.1 Introduction In the previous lesson you have learnt about the various types of financial needs. The need for finance may be for long-term, medium-term or for short-term. Export Import Bank Financing Programs The Export Import Bank of the United States (Ex Im Bank) is the official export credit agency of the United States. Ex Im Bank assists in financing the export of U.S.
Bank finance and regulation. Multi-jurisdictional survey. Thailand. Enforcement of security interests in banking transactions. Dedicated Microcomputers Group Limited and all subsidiaries. Terms and Conditions of Supply.